Castle Bravo was the code name given to the first United States test of a dry fuel hydrogen bomb, detonated on March 1, 1954, at Bikini Atoll, Marshall Islands, as the first test of Operation Castle. Castle Bravo was the most powerful nuclear device ever detonated by the United States, with a yield of 15 megatons of TNT. That yield, far exceeding the expected yield of 4 to 8 megatons, combined with shifting winds, led to the most significant radioactive contamination ever caused by the United States. Fallout from the detonation—intended to be a secret test—fell on residents of Rongelap and Utirik atolls and spread around the world. The islanders were not evacuated until three days later and suffered radiation sickness. They were returned to the islands three years later but were removed again when their island was found to be unsafe. The crew of the Japanese fishing vessel Daigo Fukuryū Maru ("Lucky Dragon No. 5") was also contaminated by fallout, which led to the death of one crew member. The blast created an international reaction about atmospheric thermonuclear testing. The device was a very large cylinder weighing 23,500 pounds (10.7 t) and measuring 179.5 inches (4.56 m) in length and 53.9 inches (1.37 m) in diameter. It was mounted in a "shot cab" on an artificial island built on a reef off Namu Island, in the Bikini Atoll. A sizable array of diagnostic instruments was trained on it, including high-speed cameras trained through an arc of mirror towers around the shot cab. Coordinates for Bravo Crater are 11°41′50″N 165°16′19″E﻿ / ﻿11.69722°N 165.27194°E﻿ / 11.69722; 165.27194. The coordinates of the remains of the Castle Bravo causeway are 11°42′6″N 165°17′7″E﻿ / ﻿11.70167°N 165.28528°E﻿ / 11.70167; 165.28528. The device was called Shrimp and had the same basic configuration (radiation implosion) as the Ivy Mike wet-device, except with a different type of fusion fuel. Shrimp used lithium deuteride, LiD, which is solid at room temperature; Ivy Mike used cryogenic liquid deuterium, LD, which required elaborate cooling equipment. Castle Bravo was the first test by the United States of a practical deliverable fusion bomb (hydrogen bomb). The successful test rendered obsolete the cryogenic design used by Ivy Mike and its derivative, the Mark 16 nuclear bomb, which was slated to be tested as the initial Castle Yankee. It also used a 7075 Aluminium 9.5 cm thick ballistic case that drastically reduced the bomb's weight, a departure from the heavy steel casing employed by contemporary weapon-projects, in an effort to increase radiation confinement. Attached to the cylindrical case was a 238U liner, the radiation case. The Shrimp design used an approximately 2.5 cm thick 238U radiation case. Its internal surface was lined with ~240 μm thick copper liner made out of 0.08 μm thick copper foil, due to copper possessing excellent reflecting properties. Natural uranium nails lined to the top of their head with copper attached the radiation case to the ballistic case. The nails were bolted in spiral arrays and in a double-shear configuration to better distribute the shear loads. This method of attaching the radiation case to the ballistic case was first used successfully in the Ivy Mike device. The radiation case had a parabolic end which housed a fission atomic bomb, the primary assembly, that was employed to create the conditions needed to start the fusion reaction, and its other end was a typical cylinder. Since the ablative process takes place on both walls of the radiation channel, a numerical estimate made with ISRINEX (a thermonuclear explosion simulation program) suggested that the 238U tamper had a thickness of 2.5 cm, so that an equal pressure would be applied to both walls of the hohlraum. The rocket effect on the surface of the walls created by the ablation of several superficial 238U layers would force an equal mass of 238U that rested in the remainder of the tamper to speed inwards, thus imploding the core and exploding the radiation case. The ballistic case would confine the exploding radiation case for as long as necessary. The fact that the hohlraum material was 238U enriched in 235U was deduced based on the final fission reaction fragments detected in the radiochemical analysis, conclusively shown by the 237U found by the Japanese in the shot debris. :282 The first generation thermonuclear weapons (MK-14, 16, 17, 21, 22 and 24) all used uranium tampers enriched to 37.5% 235U. :16 The exception to this was the MK-15 Zombie that used a 93.5% enriched fission jacket. The secondary assembly was situated in the cylindrical end of the device, where its end was screwed to the radiation case. An internal projection nested the screw and had better structural strength to support the secondary assembly which had most of the device's mass. Any other supporting structure would cause radiation transfer blockade. The other end of the radiation case was shaped like a parabola to focus the radiation emitted by the fission device. The secondary assembly was an elongated truncated cone. From its front part to its aft section it was steeply tapered. Tapering was used for two reasons; first radiation drops sharply by distance, as a function divided by the square of the distance. This made the use of a higher mass of the then scarce fusion fuel in the rear end of the secondary assembly inefficient, and the whole device wasteful. Second, by tapering, a form of quasi-parabola was created in the aft section of the radiation channel without having to machine the radiation case to a parabola at both ends, enhancing the radiation focusing and enabling a streamlined production line, as it was cheaper, faster and easier to manufacture the radiation case with only one parabolic end. The tapering in this design was much steeper than its cousins, the Runt and the Alarm Clock devices. This secondary assembly device contained the lithium deuteride fusion fuel. Running down to the center of the secondary was a ~1.3 cm thick hollow cylindrical rod of plutonium, with an about 0.5 cm aperture at its center charged with a few grams of tritium, the sparkplug, which imploded together with the secondary's compression and was timed to detonate by the first generations of neutrons that arrived from the primary. Its purpose was to compress the fusion material around it from its inside, equally applying pressure with the tamper. It weighed about 18 kg and at its detonation would yield 61 kilotonnes of TNT (260 TJ), the same as the primary assembly's yield. Then it would be completely fissioned by the fusion neutrons, contributing about 330 kilotonnes of TNT (1,400 TJ) to the total yield. The neutrons entered the assembly by a small hole through the ~28 cm thick 238U radiation shield. The hole was plugged with 10B doped paraffin wax to time the neutrons' arrival. It was positioned in front of the secondary assembly facing the primary. As the tamper-fusion capsule assembly, it also was a truncated cone. To visualize the concept, its small diameter faced the primary's side and its large diameter was "attached" to the rest of the secondary assembly. Surrounding the fusion fuel-spark plug assembly was a uranium tamper with a standoff air-gap about 0.9 cm wide that was to increase the tamper's momentum, a levitation technique used as early as Operation Sandstone and famously quoted by Ted Taylor as hammer-on-the-nail-impact. The Shrimp was at least in theory and in many aspects identical in geometry to the Runt and Runt II devices later detonated in Castle Romeo and Castle Yankee respectively. On paper it was a scaled-downed version of these devices. It used partially enriched lithium as its fusion fuel. Natural lithium is a mixture of lithium-6 and lithium-7 isotopes (with 7.5% of the former). The enriched lithium used in Bravo was nominally 40% lithium-6 (the fuel slugs varied in enrichment from 37–40% in 6Li). All these were due to shortages in enriched lithium at that time, as the first of the Alloy Development Plants (ADP) started production by the fall of 1953.:208 The volume of LiD fuel used was approximately the same as the volume of the LD filling used in the Sausage device, or about 500,000 cc, corresponding to 400 kg of lithium deuteride (as LiD has a density of 0.8 g/cc). The mixture cost about $4.54/g at that time. The fusion burn efficiency was ~25.1%, the highest attained efficiency of the first TN weapon generation, as Hans Bethe reportedly stated that those weapons had (fusion) efficiencies varying from as low as 15% to up about 25%. The thermonuclear burn would produce high energy neutrons with a temperature of 14 MeV while the reaction's neutronicity was estimated at ~0.885 (for a Lawson criterion of ~1.5). These figures do not count the 7Li isotope where the 7LiD has a neutronicity of ~0.835 and, along with the cross-sections, were given as group averages from about 2.40 to approximately 2.55 MeV and from 14.0 to 14.1 MeV; the small power group is not statistically present (see also Nuclear fusion). All of the high-energy 14 MeV neutrons would cause fission in the 238U fusion tamper wrapped around the secondary and the spark plug's plutonium rod. The ratio of deuterium atoms burned by 14 MeV neutrons spawned by the burning was expected to vary from 5:1 to 3:1, a standardisation derived from Mike, while for these estimations, the ratio of 3:1 was predominantly used in ISRINEX. Boron was also used at many locations in this dry system; it has a high cross-section for the absorption of slow neutrons which fission 235U and 239Pu, but a low cross-section for the absorption of fast neutrons which fission 238U. Because of this characteristic, 10B, deposited onto the surface of the secondary stage would prevent predetonation of the sparkplug by stray neutrons from the primary without interfering with the subsequent fissioning of the 238U fusion tamper around the secondary. Boron also played a role in increasing the compressive plasma pressure around the secondary by blocking the sputtering effect, leading to higher thermonuclear efficiency. Because the structural foam holding the secondary in place within the casing was doped with 10B, the secondary was compressed more highly, at a cost of some radiated neutrons. An example of the usefulness of 10B can be seen by the fact that the fizzled Castle Koon Morgenstern device didn't use it in its design. As a result, the intense neutron flux from its RACER IV primary pre-detonated the spherical fission sparkplug which in turn "cooked" the fusion fuel leading to an overall poor compression. The plastic's low molecular weight is unable to implode the secondary's mass. Its pressure is confined in the boiled-off sections of the tamper and the radiation case so that material from neither of these two walls can enter the radiation channel that has to be open for the radiation transit. The primary device was an LASL-furnished COBRA tritium-boosted atomic bomb, a very compact, MK-7 device. This boosted fission device was tested in the Upshot Knothole Climax event and yielded 61 kilotonnes of TNT (260 TJ) (out of 50-70 kt expected yield range), so that the planned operation Domino could be cancelled before the coming presidential election. The implosion system weighed 410 kg (900 lb) and used the more powerful Cyclotol 75/25 instead of the Composition B used in most bombs at that time, with the assembled module weighing 830 kg (1,840 lb) and measuring 770 mm (30.5 in) across. It was located at the end of the device which, as seen in the declassified films, show a small cone projecting from the ballistic case. This cone is actually the part of the parabola that was used to focus the radiation emanating from the primary to the secondary. The Castle Bravo mushroom cloud. The detonation took place at 06:45 on March 1, 1954 local time (18:45 on February 28 GMT). When Bravo was detonated, it formed a fireball almost four and a half miles (roughly 7 km) across within a second. This fireball was visible on Kwajalein atoll over 250 miles (400 km) away. The explosion left a crater 6,500 feet (2,000 m) in diameter and 250 feet (76 m) in depth. The mushroom cloud reached a height of 47,000 feet (14,000 m) and a diameter of 7 miles (11 km) in about a minute, a height of 130,000 feet (40 km) and 62 mi (100 km) in diameter in less than 10 minutes and was expanding at more than 100 meters per second (360 km/h; 220 mph). As a result of the blast, the cloud contaminated more than seven thousand square miles of the surrounding Pacific Ocean including some of the surrounding small islands like Rongerik, Rongelap and Utirik. In terms of TNT tonnage equivalence, Castle Bravo was about 1,000 times more powerful than each of the atomic bombs which were dropped on Hiroshima and Nagasaki during World War II. Castle Bravo is the fifth largest nuclear explosion in history, exceeded by the Soviet tests of Tsar Bomba at approximately 50 Mt, Test 219 at 24.2 Mt, and two other ~20 Mt Soviet tests in 1962 at Novaya Zemlya. The fission reactions of the natural uranium tamper were quite dirty, producing a large amount of fallout. That, combined with the much-larger-than-expected yield and a major wind shift, produced some very serious consequences. In the de-classified film Operation Castle, task force commander Major General Percy Clarkson points to a diagram indicating that the wind shift was still in the range of "acceptable fallout", although just barely. The decision to carry out the Bravo test under the prevailing winds was made by Dr. Alvin C. Graves, the Scientific Director of Operation Castle. Graves had total authority over detonating the weapon, above that of the military Commander of Operation Castle. Graves appears in the widely available film of the earlier 1952 test "Ivy Mike", which examines the last-minute fallout decisions. The narrator, Western actor Reed Hadley, is filmed aboard the control ship in that film, showing the final conference. Hadley points out that 20,000 people live in the potential area of the fallout. He asks the control panel scientist if the test can be aborted and is told "yes", but it would ruin all their preparations in setting up timed measuring instruments in the race against the Russians. 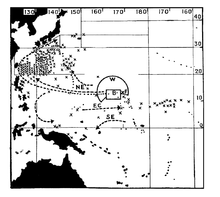 In Mike the fallout correctly landed north of the inhabited area but, in the 1954 Bravo test, there was a lot of wind shear, and the wind that was blowing north the day before the test steadily veered towards the east. Radioactive fallout was spread eastward onto the inhabited Rongelap and Rongerik atolls, which were evacuated 48 hours after the detonation. Ultimately, 15 islands and atolls were contaminated, and by 1963 Marshall Islands natives began to suffer from thyroid tumors, including 20 of 29 Rongelap children at the time of Bravo, and many birth defects were reported. The islanders received compensation from the U.S. federal government, relative to how much contamination they received, beginning in 1956; by 1995 the Nuclear Claims Tribunal reported that it had awarded $43.2 million, nearly its entire fund, to 1,196 claimants for 1,311 illnesses. A medical study, named Project 4.1, studied the effects of the fallout on the islanders. Medical examination of people who were affected by the fallout. A Japanese fishing boat, Daigo Fukuryū Maru (Lucky Dragon No.5), came in direct contact with the fallout, which caused many of the crew to grow ill; one died of a secondary infection. This resulted in an international incident and reignited Japanese concerns about radiation, especially as Japanese citizens were once more adversely affected by U.S. nuclear weapons. :542 The official U.S. position had been that the growth in the strength of atomic bombs was not accompanied by an equivalent growth in radioactivity released. Japanese scientists who had collected data from the fishing vessel disagreed with this. Sir Joseph Rotblat, working at St Bartholomew's Hospital, London, demonstrated that the contamination caused by the fallout from the test was far greater than that stated officially. Rotblat was able to deduce that the bomb had three stages and showed that the fission phase at the end of the explosion increased the amount of radioactivity a thousandfold. Rotblat's paper was taken up by the media, and the outcry in Japan reached such a level that diplomatic relations became strained and the incident was even dubbed by some as "a second Hiroshima". Nevertheless, the Japanese and U.S. governments quickly reached a political settlement, with the transfer to Japan of US $15,300,000 as compensation, with the surviving victims receiving about ¥ 2 million each ($5,550 in 1954, or about $49,000 in 2016) It was also agreed that the victims would not be given Hibakusha status. Unanticipated fallout and the radiation emitted by it also affected many of the vessels and personnel involved in the test, in some cases forcing them into bunkers for several hours. In contrast to the crew of the Lucky Dragon No. 5, who did not appreciate the hazard and therefore did not take shelter in the hold of their ship, or refrain from inhaling the fallout dust, the firing crew that triggered the explosion was able to safely shelter in their firing station when they noticed the wind was carrying the fallout in the unanticipated direction towards the island of Enyu on the Bikini Atoll where they were located, with the fire crew sheltering in place ("buttoning up") for several hours until outside radiation decayed to safer levels. 250 rads were recorded above the bunker. Sixteen crew members of the aircraft carrier USS Bairoko received beta burns and there was an increased cancer rate among its crew. Radioactive contamination also affected many of the testing facilities built on other islands of the Bikini atoll system. A world-wide network of gummed film stations was established to monitor fallout following Operation Castle. Although meteorological data was poor, a general connection of tropospheric flow patterns with observed fallout was evident. There was a tendency for fallout/debris to remain in tropical latitudes, with incursions into the temperate regions associated with meteorological disturbances of the predominantly zonal flow. Outside of the tropics, the Southwestern United States received the greatest total fallout, about five times that received in Japan. Stratospheric fallout particles of strontium-90 from the test were later captured with balloon-borne air filters used to sample the air at stratospheric altitudes, the research (Project Ashcan) was conducted to better understand the stratosphere, fallout times and arrive at more accurate meteorological models after hindcasting. In addition to the radiological accident, the unexpectedly high yield of the device severely damaged many of the permanent buildings on the control site island on the far side of the atoll. Little of the desired diagnostic data on the shot was collected; many instruments designed to transmit their data back before being destroyed by the blast were instead vaporized instantly, while most of the instruments that were expected to be recovered for data retrieval were destroyed by the blast. The fallout also affected islanders who had previously inhabited the atoll, and who returned there some time after the tests. This was found to be due to the presence of radioactive caesium in locally grown coconut milk. Plants and trees absorb potassium as part of the normal biological process, but will also readily absorb caesium if present, being of the same group on the periodic table, and therefore very similar chemically. Islanders consuming contaminated coconut milk were found to have abnormally high concentrations of caesium in their bodies and then had to be evacuated from the atoll a second time. In 2013 the Defense Threat Reduction Agency released Castle Bravo: Fifty Years of Legend and Lore. The Soviet Union had previously used lithium deuteride in its Sloika design (known as the "Joe-4" in the U.S.), in 1953. It was not a true hydrogen bomb; fusion provided only 15–20 percent of its yield, most coming from boosted fission reactions. Its yield was 400 kilotons, and it could not be infinitely scaled, as with a true thermonuclear device. The Teller-Ulam-based "Ivy Mike" device had a much greater yield of 10.4 Mt, but most of this also came from fission: 77 percent of the total came from fast fission of its natural uranium tamper. Castle Bravo had the greatest yield of any U.S. nuclear test, 15 Mt, though again, a substantial fraction came from fission. In the Teller-Ulam design, the fission and fusion stages were kept physically separate in a reflective cavity. The radiation from the exploding fission primary brought the fuel in the fusion secondary to critical density and pressure, setting off thermonuclear (fusion) chain-reactions, which in turn set off a tertiary fissioning of the bomb's outer casing. Consequently, this type of bomb is also known as a "fission-fusion-fission" device. The Soviet researchers, led by Andrei Sakharov, developed and tested their first Teller-Ulam device in 1955. The publication of the Bravo fallout analysis was a militarily sensitive issue, with Joseph Rotblat possibly deducing the staging nature of the Castle Bravo device by studying the ratio and presence of tell-tale isotopes, namely uranium-237, present in the fallout. This information could potentially reveal the means by which megaton-yield nuclear devices achieve their yield. Soviet scientist Sakharov hit upon what the Soviet Union regarded as "Sakharov's third idea" during the month after the Castle Bravo test, the final piece of the puzzle being the idea that the compression of the secondary can be accomplished by the primary's x-rays before fusion began. As a result of the extensive fallout, Nevil Shute wrote the novel On the Beach, which was released in 1957. The novel is about a war that released so much radioactive fallout that all the life in the Northern Hemisphere disappeared, while the Southern Hemisphere awaited a similar fate. However the American government voiced a criticism of this premise—a threat of extinction from nuclear war—because they did not have enough nuclear weapons to cause human extinction. Similarly the premise that all of humanity would die following a nuclear war and only the "cockroaches would survive" is critically dealt with in the book Would the Insects Inherit the Earth, and Other Subjects of Concern to Those Who Worry About Nuclear War. A combination of the Castle Bravo detonation, alongside the subsequent poisoning of the Lucky Dragon 5, and the resultant flashbacks to the bombings of Hiroshima and Nagasaki all culminated in the creation of what is perhaps Japan's most widely recognized media icon, Godzilla. During the opening scene of the 2014 American Godzilla reboot and in the prequel comic Godzilla: Awakening, the Castle Bravo nuclear test was an attempt to kill Godzilla and a prehistoric parasite called "Shinomura". Godzilla, however, survived the "test", despite humanity believing otherwise, while the Shinomura was incinerated. 1 2 3 4 5 6 "Operation Castle". nuclearweaponarchive.org. May 17, 2006. Retrieved 2016-05-20. ↑ "The Ghost Fleet of Bikini Atoll". Mystery of Old World Cultures. October 11, 2009. A&E Television Networks. Military History Channel. Retrieved 2016-05-20. ↑ Foster, John Bellamy (2009). The Ecological Revolution: Making Peace with the Planet. Monthly Review Press. p. 73. ↑ Danneskiold, Jim (April 14, 2005). "Operation Castle tests focus of April 20 panel discussion". Los Alamos National Laboratory. Archived from the original on 2009-05-07. 1 2 3 4 Rhodes, Richard (1995). Dark Sun: The Making of the Hydrogen Bomb. New York: Simon and Schuster. ISBN 0-684-80400-X. 1 2 Hansen, Chuck (1995). Swords of Armageddon. IV. Retrieved 2016-05-20. 1 2 3 Hansen, Chuck (1995). Swords of Armageddon. III. Retrieved 2016-05-20. ↑ Titus, A. Costandina (2001). Bombs in the Backyard: Atomic Testing and American Politics. Reno: University of Nevada. 1 2 Kunkel, Thomas; Ristvet, Brian (January 25, 2013). "Castle Bravo: Fifty Years of Legend and Lore" (PDF). Albuquerque, NM: Defense Threat Reduction Agency. Archived from the original (PDF) on 2014-03-10. Retrieved 2016-05-20. ↑ "Les cobayes du Dr Folamour". Le Monde (in French). June 22, 2009. Retrieved 2016-05-20. 1 2 3 "Nuclear Issues". Retrieved 2016-05-20. ↑ Sevitt, S. (July 23, 1955). "The Bombs". The Lancet. 266 (6882): 199–201. doi:10.1016/s0140-6736(55)92780-x. ↑ "50 Facts About U.S. Nuclear Weapons". The Brookings Institution. August 1996. Archived from the original on 2011-07-19. Retrieved 2016-05-20. ↑ Hirano, Keiji (February 29, 2004). "Bikini Atoll H-bomb damaged fisheries, created prejudice". Chugoku. Archived from the original on 2013-04-29. Retrieved 2016-05-20. 1 2 Clark, John C. (July 1957). Robert Cahn, ed. "Trapped by Radioactive Fallout" (PDF). Saturday Evening Post. Retrieved 2016-05-20. ↑ Hoffman, Michael (August 28, 2011). "Forgotten atrocity of the atomic age". Japan Times. p. 11. Retrieved 2016-05-20. ↑ Ely, Dave. "Operation Castle: Bravo Blast". dgely.com. ↑ DeGroot, Gerard (2004). The Bomb: A Life. London: Jonathan Cape. pp. 196–198. ISBN 0-224-06232-8. ↑ List, Robert J. (May 17, 1955). World-Wide Fallout from Operation Castle (Report). doi:10.2172/4279860. OSTI 4279860. Retrieved 2016-05-20. ↑ Machta, Lester; List, Robert J. (March 1, 1959). Analysis of Stratospheric Strontium90 Measurements. Journal of Geophysical Research (Report). OSTI 4225048. (subscription required (help)). ↑ Winter, Mark. "Caesium biological information". WebElements Periodic Table of the Elements. Retrieved 2016-05-20. ↑ Nash, Gary B.; et al. (2007). The American People: Creating a Nation and a Society (6th ed.). New York: Longman. ISBN 0205805531. ↑ Braun, Reiner (2007). Joseph Rotblat: Visionary for Peace. Wiley-VCH. ISBN 3-527-40690-5. ↑ Geer, Lars-Erik De (1991). "The Radioactive Signature of the Hydrogen Bomb" (PDF). Science & Global Security. Gordon and Breach Science Publishers. 2: 351–363. doi:10.1080/08929889108426372. Retrieved 2016-02-22. ↑ Bartlett, Andrew (2004). "Nuclear Warfare in the Movies". Retrieved 2016-05-20. ↑ Brothers, Peter H. (2009). Mushroom Clouds and Mushroom Men: The Fantastic Cinema of Ishiro Honda. AuthorHouse.